Festivals are a terrific way to connect with other birders, learn about birding hotspots, hear new speakers, and learn from experts on guided tours. They are also great for outings with family and friends. 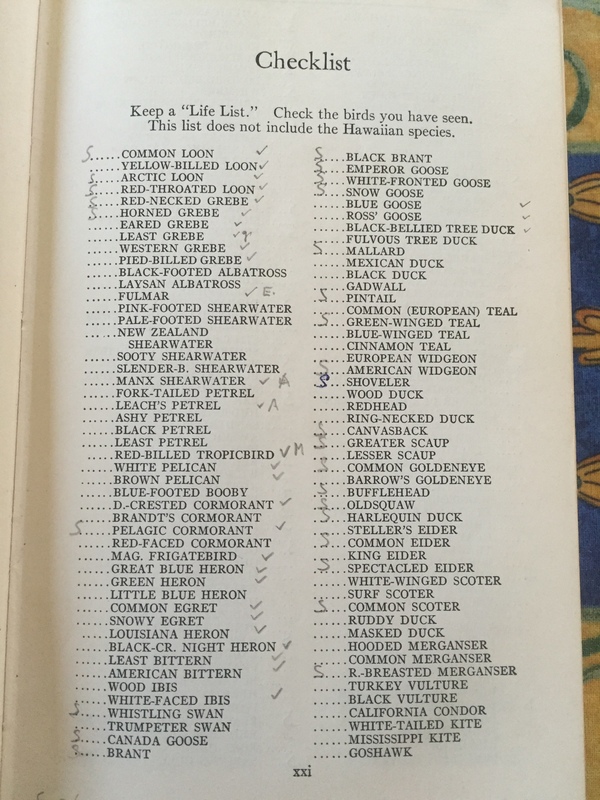 Alberta offers some fantastic bird and nature festivals, so I decided to compile this year’s listing as a handy reference. If you know of an event to add to the list, please let me know in the comments below so I can make the changes. — April 23-24, 2016: This year marks the 17th annual Tofield Snow Goose Chase organized by the Edmonton Nature Club and the town of Tofield. In the morning, stop in at the town hall to see the displays and exhibits from the Edmonton Valley Zoo, Beaverhill Bird Observatory, John Acorn “The Nature Nut“, and Pete Heule from the Royal Alberta Museum. I’ll be there too with the Young Naturalists’ Corner. 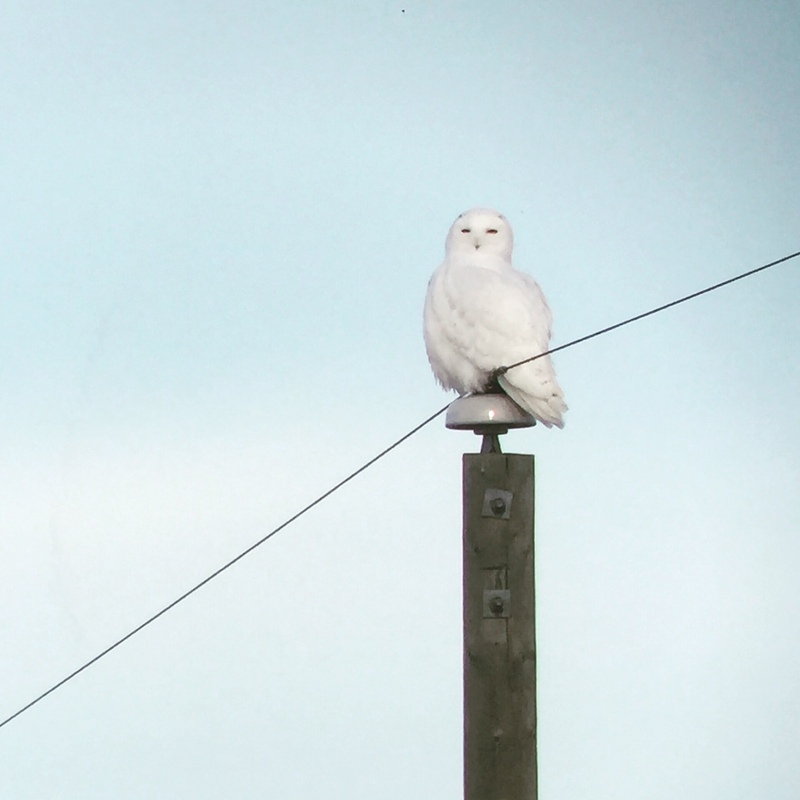 There will be an owl banding talk and public bus trips for viewing the Snow Geese, swans, and other spring migrants. — April 23-24, 2016: The Friends of Saskatoon Island along with Alberta Parks celebrate the return of Trumpeter Swans to the Peace Country by holding the Saskatoon Island Swan Festival, features guided tours, presentations, and activities for families. 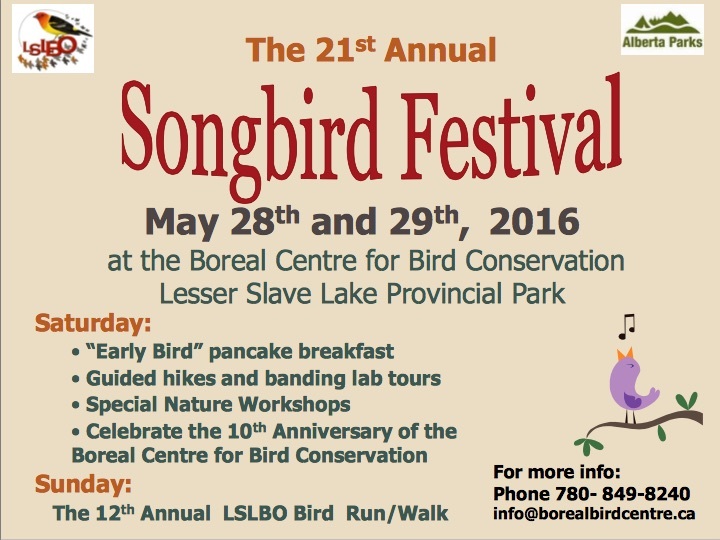 — May 28-29, 2016: The Lesser Slave Lake Bird Observatory holds a Songbird Festival in Slave Lake, Alberta. 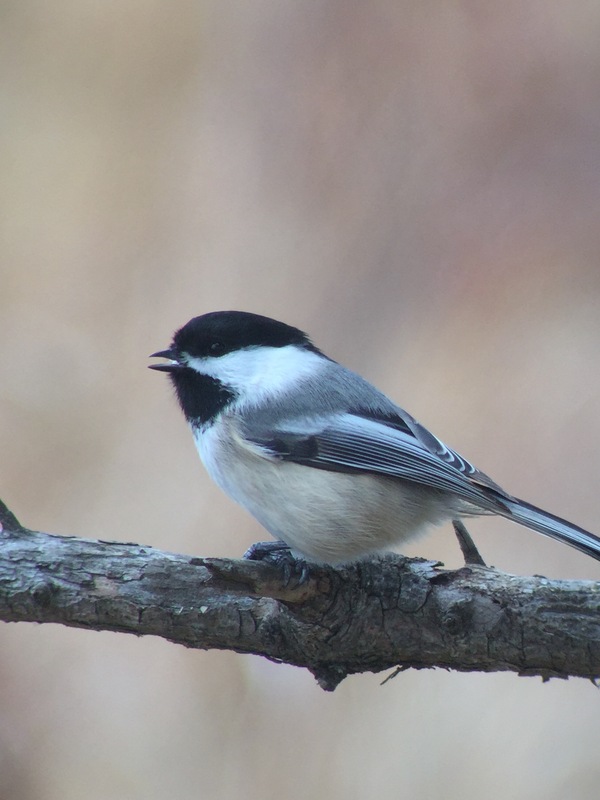 The event kicks off on Saturday with a pancake breakfast followed by guided birding hikes, workshops, and tours of the migration monitoring station. — Saturday, June 18, 2016: The Camrose Purple Martin Festival will be celebrating its seventh annual festival this year with keynote speakers, bus and walking tours to Purple Martin colonies, activities for kids, and tips and techniques for making a wildlife-friendly yard. — June 19-23, 2016: The Waterton Wildflower Festival celebrates Waterton as the wildflower Capital of Canada. The festival features guided walks on plant identification and park ecosystems, family programs, and photographic presentations. 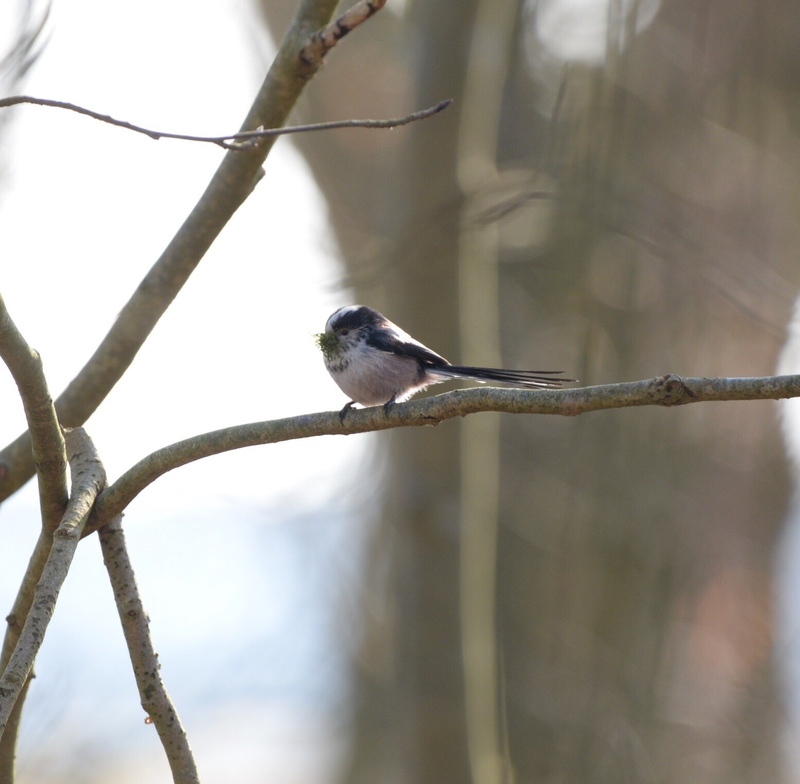 Last year the festival offered birding sessions with experienced guides, so they might be available this year too. — July 1st, 2016: The Ellis Bird Farm Bluebird Festival near Lacombe, Alberta, focuses on the Mountain Bluebirds that nest around the farm. Come to the farm for free crafts for children, a talk on Purple Martin and Mountain Bluebird migration research, and a Neighbour’s Market. — July 23rd, 2016: The Ellis Bird Farm BioBlitz will feature biologists on site to share their expertise on all the wildlife at the farm, as well as site tours. — August 6, 2016: The Ellis Bird Farm’s Bug Jamboree opens with a performance by John Acorn, “The Nature Nut”, and a butterfly count. Garden tours and children’s crafts are also part of the event. 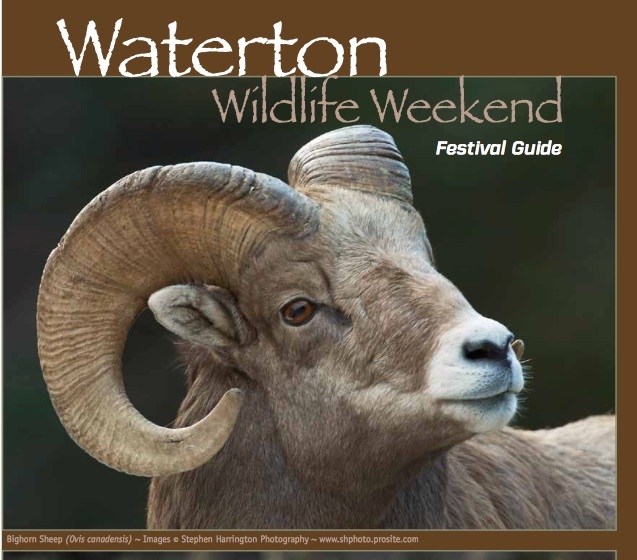 — September (date to be announced): Waterton also hosts a wildlife festival in September, celebrating the park as one of the best places in the Rocky Mountains to view wildlife, especially mammals. Bighorn sheep, elk, deer, bears, and foxes, more than 200 species of birds, six species of amphibians, four species of reptiles, and 24 species of fish have been found in the Park. Workshops, presenters, and guided walks are some of the activities at the festival. — October (date to be announced): Canmore celebrates the migration of Golden Eagles over the Alberta Rockies with a Festival of the Eagles. The weekend celebration includes guided hikes, bird walks, interpretive displays, and guest speakers. Spotting scopes are set up at Canmore Collegiate High School to view the migrating eagles. 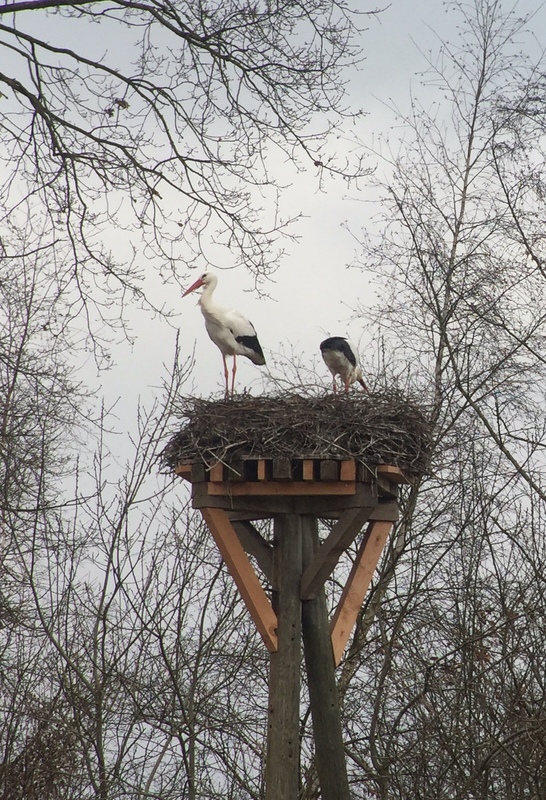 We drove around the area of the Dümmer See, a lake in Nordwestmecklenburg, and I found this pair of White Storks on a nest. These weren’t the first storks of my trip, but it was nice to see them in the province of Niedersachsen (Lower Saxony). I made this poster for the signing and posted them around town. 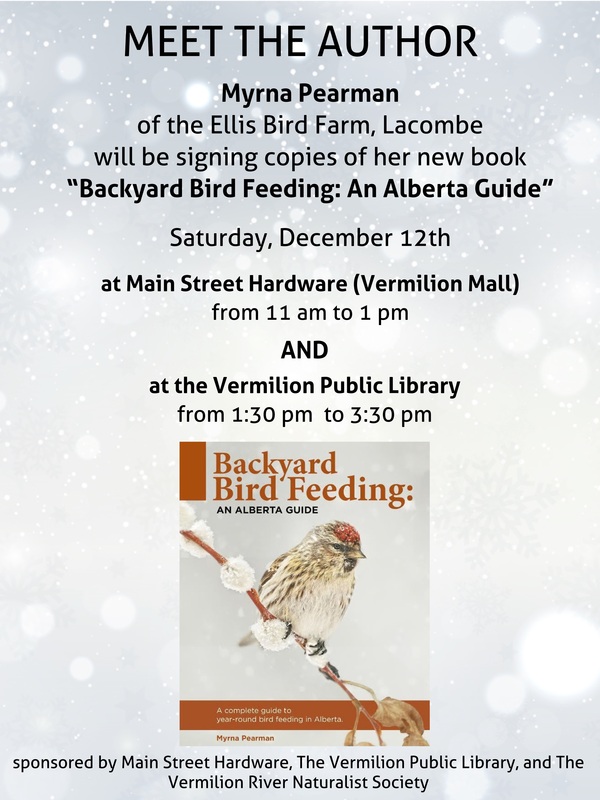 I’ve been meaning to post about biologist and author Myrna Pearman‘s Vermilion book signing this past December for some time now, but December, January, and February have been so busy between holidays, school, and activities. 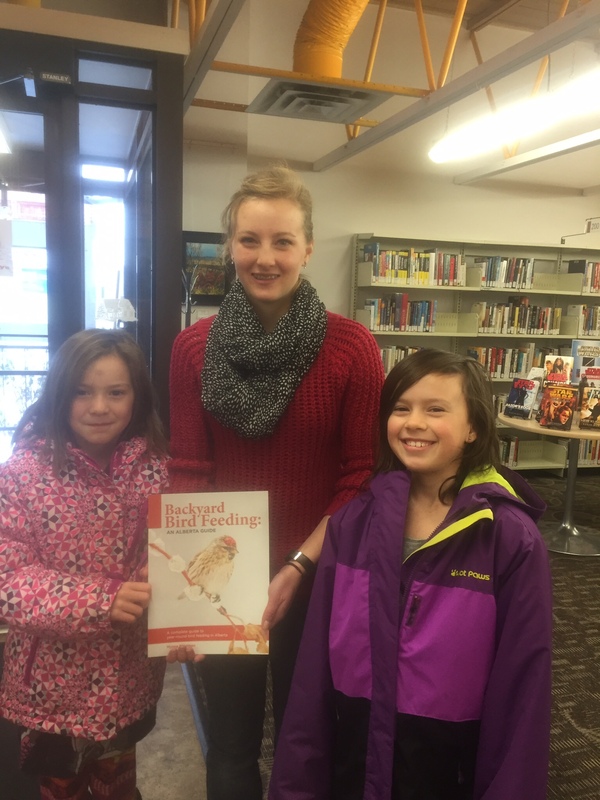 Myrna’s new book, Backyard Bird Feeding: An Alberta Guide, was published late last year. 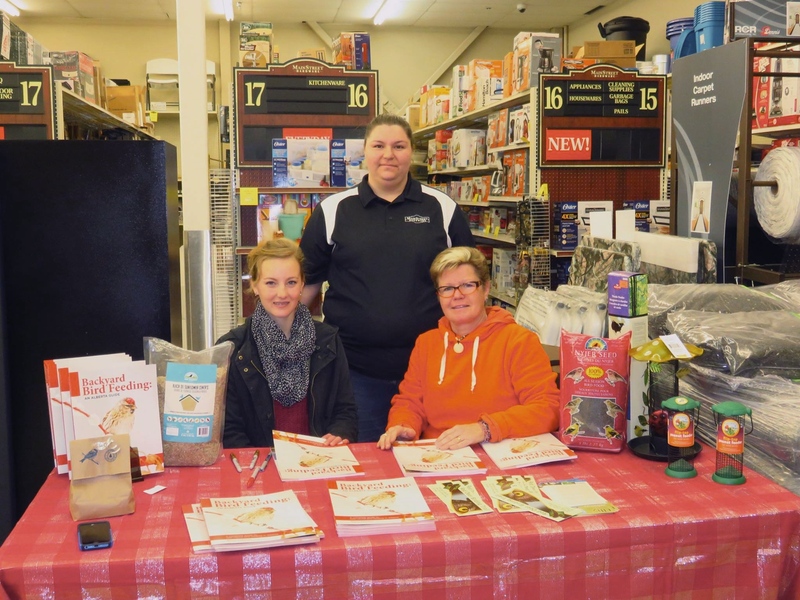 During November and the early part of December, Myrna traveled around Alberta to various Peavey Mart/Main Street Hardware Stores for book signings; Peavey Mart is one of the book’s sponsors. Having corresponded with Myrna about photos for the book, I was looking forward to meeting her and so emailed her to ask if she might be coming to Vermilion for a signing. The powers that be weren’t sure that there would be enough interest in our small town, so the originally scheduled signing had been cancelled. I told Myrna I would see if I could gauge interest, and in the end there was enough for a book signing not only at Main Street Hardware but also at our local library. 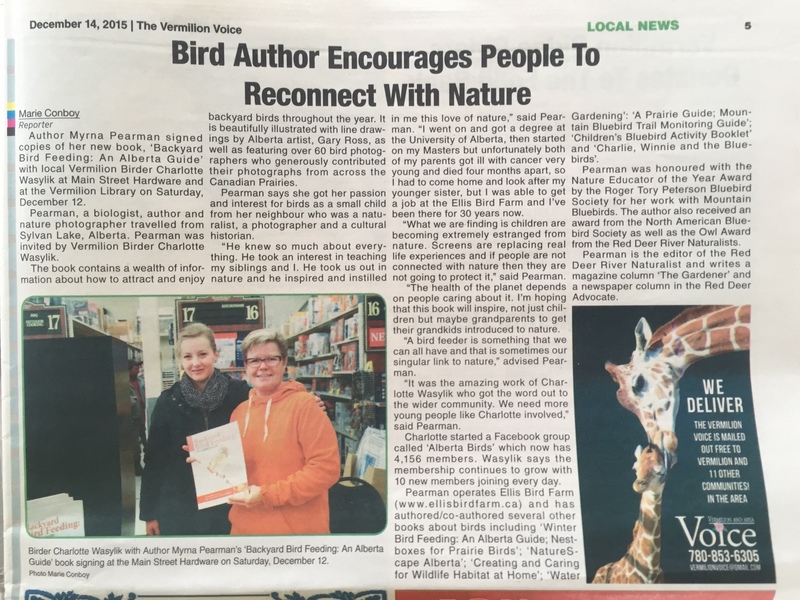 As president of the Vermilion River Naturalist Society, I brought up the signings at our November meeting, and members decided to join the other businesses as a sponsor of the signing. 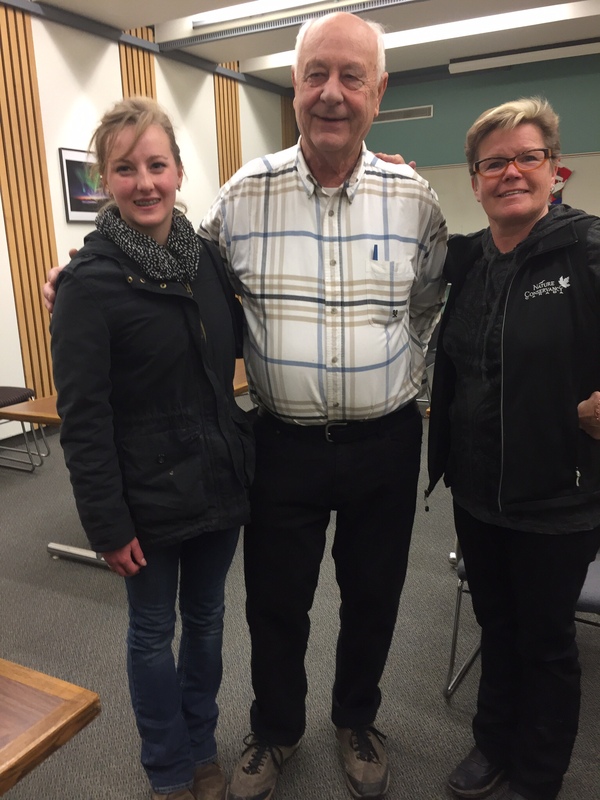 Fortunately, despite the snow the night before the signing, Myrna made the drive from Lacombe safely. I spent the day with Myrna starting with the first signing at 11 am at Main Street Hardware. There wasn’t an idle moment, with many people getting their books signed and talking to Myrna about the birds in their backyard. With Vermilion Main Street Hardware manager Ebony (standing), and Myrna (seated, at right). MSH provided us with feeders and bags of birdseed for the display and also offered coffee and doughnuts. We moved our table to the library after a quick lunch. During our time there, we had a bit more time to talk and learned that we are related through marriage — it is such a small world! Our adventure continued on into the evening since Myrna had been invited to the Wainwright Wildlife Society’s annual Christmas supper. She gave a presentation about the important work the Ellis Bird Farm does, and a slideshow of her amazing bird and mammal photos. Knowing it was going to be a long day with a long ride back to Lacombe, my mother had invited Myrna to spend the night, so we had more time to talk in the evening and then in the morning over breakfast. After knowing Myrna only through email correspondence, it was very nice to finally meet her in person. I’d like to thank Main Street Hardware, the Vermilion Public Library, and everyone who came out for the book signing! I started digiscoping several years ago with my Swarovski scope, point and shoot Canon camera, and a homemade adapter. Now that I have an iPhone, I’ve been using it for digiscoping both handheld and with adapters. With some practice, determination, and a little luck you can get some really great photos. Digiscoping is a photography technique using a camera with a spotting scope or binoculars to take pictures. The word “digiscoping” is a combination of “digital camera” and ”spotting scope”. 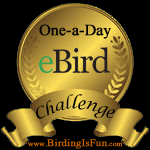 Digiscoping started out with DSLR cameras, but advances in smartphone cameras and sensors have made digiscoping incredibly easy with a camera that many have with us all the time. So often, the best camera is the one that is closest to hand. For handheld digiscoping, extend the eyecup on the scope to provide some “relief” for the phone; this helps focus the camera and also prevents scratching the scope’s lens. Hold the camera back until you see the point of light through the scope, then slowly move the phone down until the bird or whatever you’re photographing comes into focus on the camera. Once you have the phone in position, zoom in a little and tap the screen to focus. Using a digiscoping adapter eliminates the whole process of aligning both camera and scope and makes it much easier to keep the phone in place for an extended period of time. 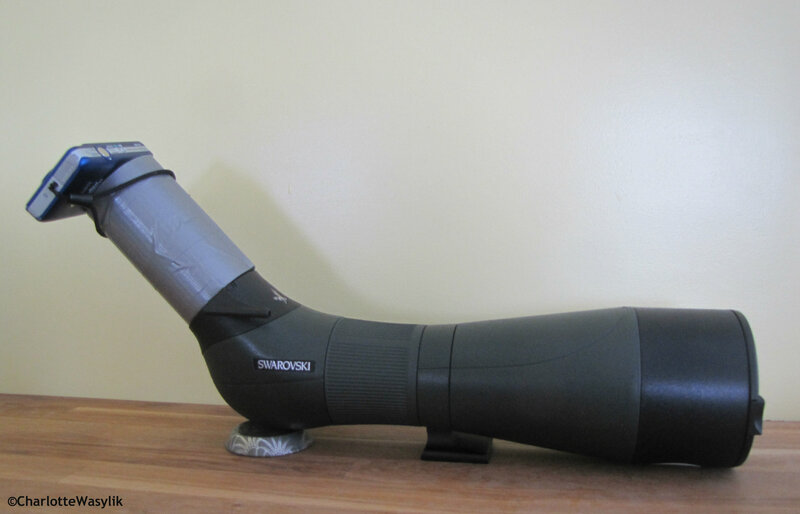 Many companies make adapters for their scopes, including Swarovski, Kowa, Opticron, and Meopta. And PhoneSkope makes adapters for almost every make and model of phone and scope. Viking Optical, NovaGrade, SnapZoom, and Carson Optical make universal adapters which are great for digiscopers who have various phones or scopes, or who bird with others who want to get digiscoped photos. Universal adapters, however, do require adjustments in the field. 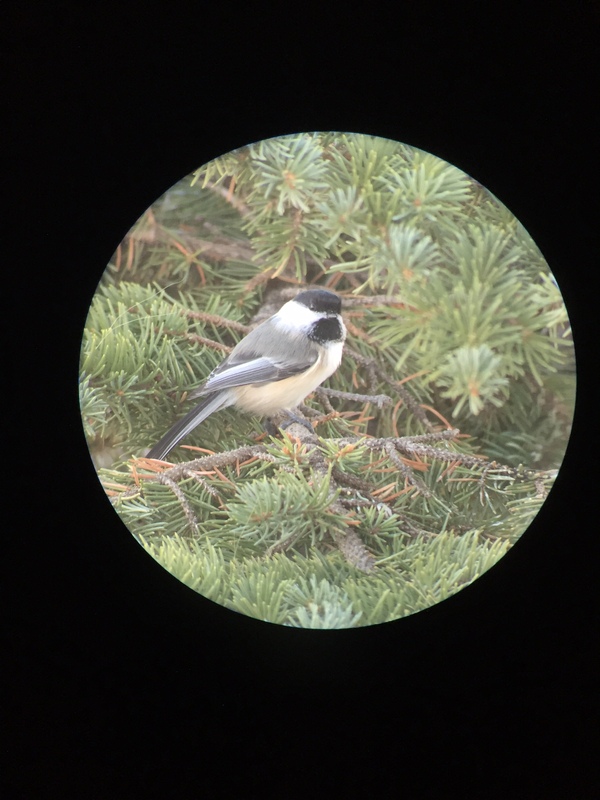 A Black-capped Chickadee digiscoped with my Swarovski scope, 20-60 zoom eyepiece, and Phone Skope adapter. Vignetting is the dark circle around your view through a scope or binoculars. In digiscoping, vignetting can be eliminated by increasing the magnification on the scope or camera until you no longer see the dark edges. It can also be edited out in iPhoto or Photoshop or whatever you use to crop images. Smartphones are particularly good for taking photos in low light, but the quality of your optics still has a big impact on your photos. A scope with good light-gathering ability is optimal for photos taken at dusk or on an overcast day. Try to have the sun at your back when digiscoping as this will ensure good light on the subject. Backlit photos can be very nice as well, so try both types of lighting. Practice using your camera’s exposure adjustments. If you tap where the image is brightest, the iPhone will self-adjust to the correct exposure. If you are photographing a subject that’s a little too dark or too bright and the camera doesn’t accurately guess the exposure, use the slider to make adjustments by dragging your finger up and down the screen. You can lock the exposure by holding your finger until you see “AF/AE Lock”. While the iPhone camera works well, if you want more control over your camera and photos, try the Manual, and ProCamera, and Camera+ apps. Camera shake is a terrible problem for many of us. Anything that shakes your setup will greatly increase the risk of blurry, or unfocused photos. Many people don’t realize that the headphones that come with the iPhone (the volume buttons) can act as a remote shutter release. This is a great technique to use if you want to reduce contact with the phone. There are also remote shutter releases that can control your iPhone camera via Bluetooth or use voice commands to take photos with Android devices. If your photos need some help, try photo editing apps. Upload photos to apps like PicTapGo, SnapSeed, or Hipstamatic to make minor adjustments. These apps can fix and enhance contrast, exposure, and sharpness quickly and easily. Instagram can also turn a lesser quality photo into something great with a filter and some editing. For videos, hold your phone horizontally to take video as most uploading sites, such as YouTube and Vimeo, are designed for horizontal clips. I would love to see your digiscoped photos, so please link to yours in the comments below! I wrote in my my previous FoF that I thought I’d have to wait until I get home from Europe to see my first Canada Goose. 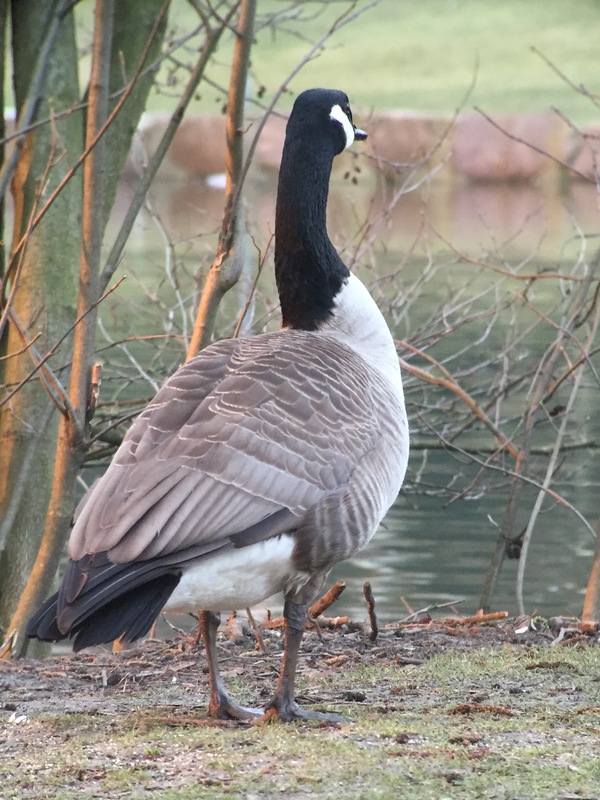 I’m feeling sheepish having to admit that my first Canada Goose sighting this year was in a park at Recklinghausen, Germany, the other day. This photo was taken with my Swarovski binoculars and the Phone Skope adapter with binocular ring. 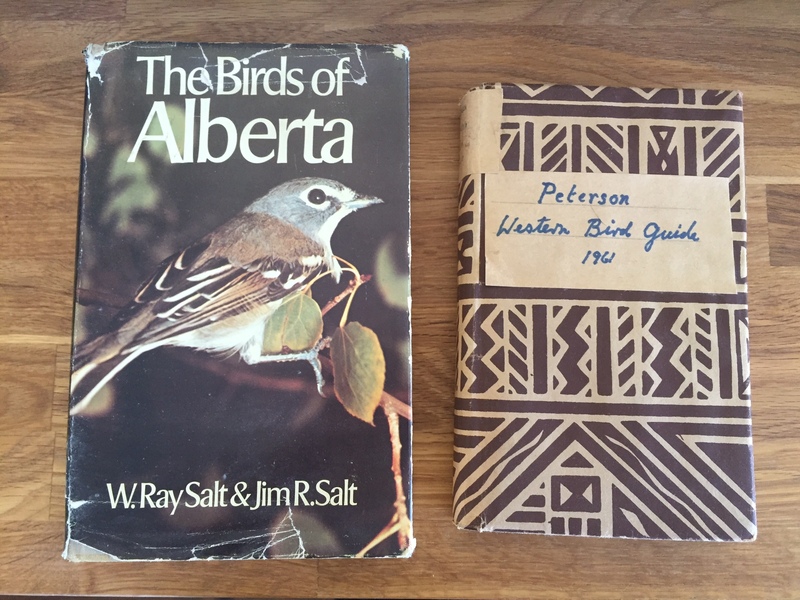 My Facebook friend Michael sent me a message last May to offer me his copies of Birds of Alberta by W. Ray Salt and Jim R. Salt and an autographed second edition of Peterson’s Field Guide to Western Birds (1961). Since Michael lives in Edmonton, he dropped the books off at the Wild Bird General Store from where I picked them up a few days later. I’ve recently had the chance to spend more time reading through them. It’s wonderful to have them in my collection. Thank you very much for such a generous gift, Michael, and for thinking of me. 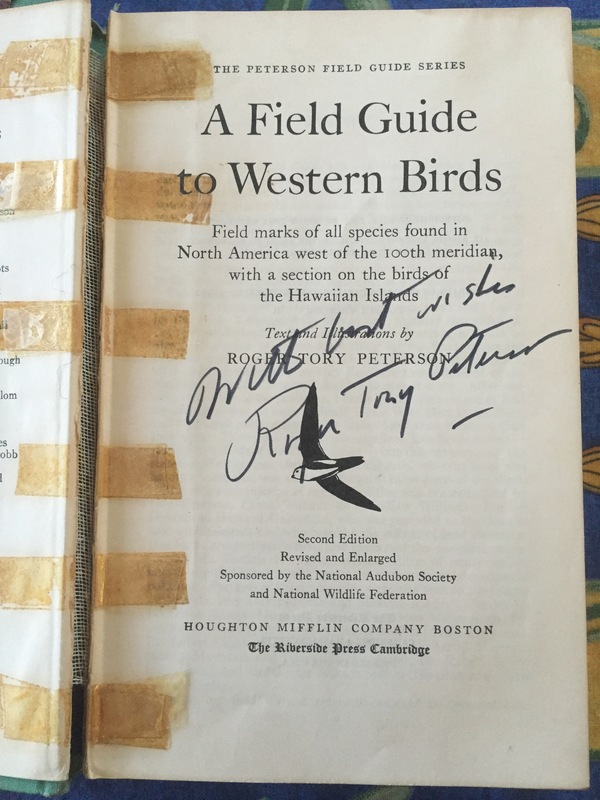 Michael told me that the autographed Peterson Field Guide was previously owned by the late Dr. Otto Hohn of the University of Alberta, an avid birder and international expert on avian endocrinology. My mother just got me a copy of one of Dr. Hohn’s books, A Northern Naturalist, which I’m also looking forward to reading. Thank you, too, Michael, for the introduction to Dr. Hohn.